I was startled awake at 5:30 AM by a loud rapping on the bedroom window. It was the next door neighbor of our rented Hilo water view house telling my wife and I that we had to evacuate. A Pacific-wide tsunami warning, following Chile’s catastrophic earthquake in February 2010, had been issued. Not knowing if we’d see our beautiful Japanese beach house again, we drove the 30 minutes to Volcano National Park, 4,000 feet elevation. The Park is home to one of Earth’s most active volcanos – in an island chain born of volcanos. As we had breakfast in the tropical forest we were struck that we had fled to the sides of an active volcano to escape a tsunami. This is the fragility of paradise; an environment that allows for abundance yet it just may convulse and destroy it all. Fortunately, Hawai’i was spared this time, but that wasn’t the case in 1950. 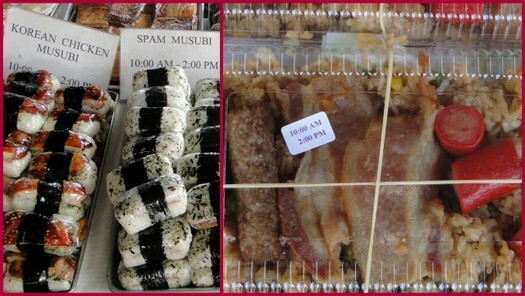 Later that week we drove the ten miles into Hilo for a day at the already famous Hilo Market – founded in 1988. I was struck by the vaguely shabby feel of Hilo’s commercial waterfront. Some fine examples of Art Deco, tropical Victorian and Arts & Crafts architecture are in various states of repair or restoration. A substantial swath of land forms a buffer between the historic commercial center and the Pacific Ocean. It makes for attractive park land, athletic fields and water activities, but that’s not the reason for its existence. For nearly a century, prior to 1950, this land had been Japan Town, a warren of shanties and pan-Asian cooking. The legacy of Japan Town lives on in the Puna’s suburb Asian fusion cuisine. In a brief period of time one morning in 1950, Japan Town was swept into the sea by a tsunami created by one of history’s most catastrophic earthquakes centered in the same area of Chile as the 2010 event. The Hilo Market area occupies land that had been devastated by that tsunami. 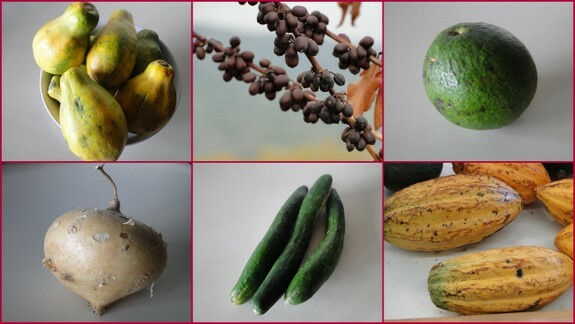 As we neared the market, the scents and sights pulled us quickly along. 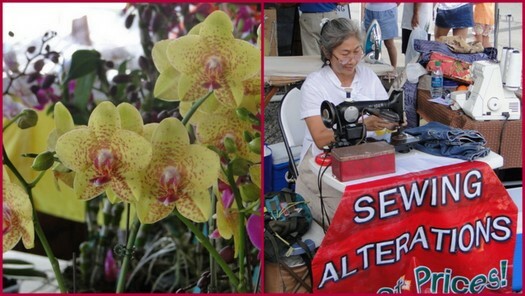 The main stalls, flower vendors, clothing, crafts, jewelry and a seamstress radiated onto the surrounding sidewalks. The Hilo Market is not really a building. 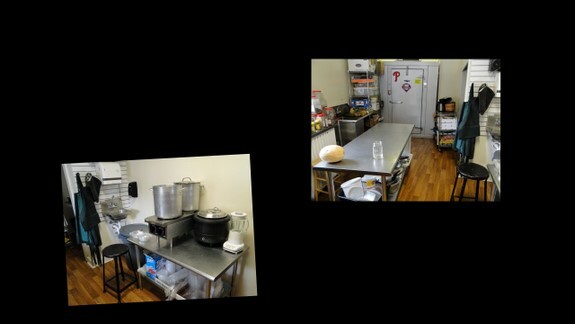 The main stalls are under a permanent cover with no walls (fortunately or else it would feel like an oven). It’s a bustling place. Organic lettuce is sold next to carnivorous plants. 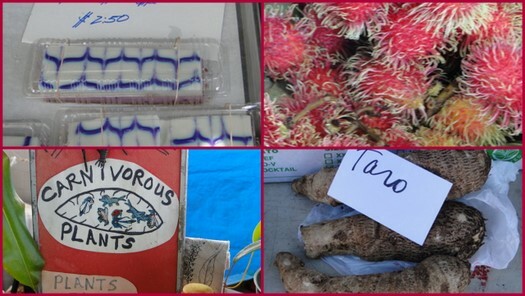 Taro root’s for sale if you want to make your own poi or tapioca. 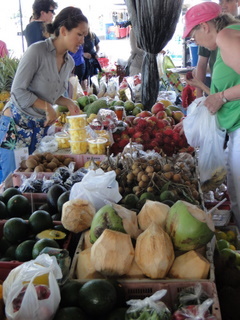 Exotic fruits and vegetables from Asia and the Pacific are in abundance and require conversations with vendors and fellow market goers for preparation suggestions. It’s a riot of color, textures and sounds! Top pics: sweet potato cheese cake and "what is it?" 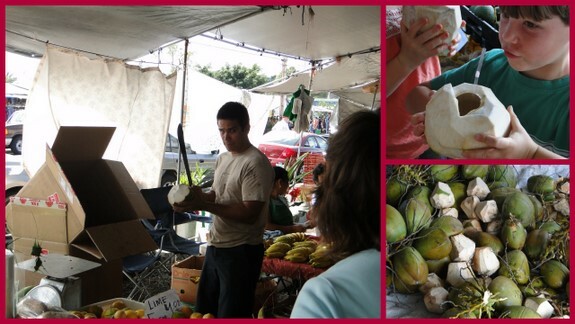 The fresh coconut “milk” vendor is a perennial favorite in the tropics. Fresh, iced green coconuts have their tops sliced off with a machete. A straw is all that’s needed to enjoy a truly refreshing drink. Often when finished, the soft green shell is cut in half exposing the pudding-like coconut that can be eaten with a spoon – a double treat ! 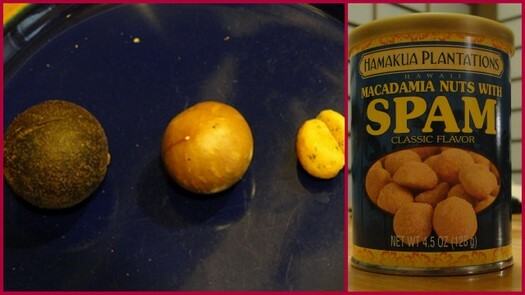 The multi-cultural quilt that is Hawai’i resulted in a fusion of comfort foods. During the Second World War, that marvel of canned foods, SPAM, hit Hawai’i like a rock star. Overnight, the refrigerator scarce islands of the 1940’s found a food of remarkable flexibility, even if it is lacking in other qualities. 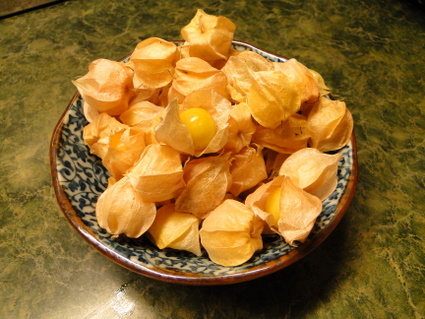 The macadamia nut is nearly synonymous with Hawai’i, even though it’s native to Australia. What processors do to this buttery treat is legendary, and for another blog post, but suffice to say, the nut also married SPAM. 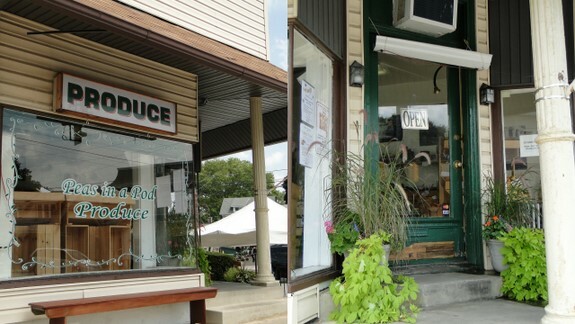 Farmers markets are in nearly all small towns, and even between them, on the island. 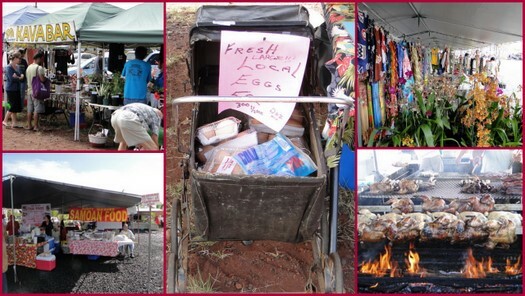 The Sunday market near Hawaiian Paradise Park, south of Hilo, offers a large variety of local crafts, musical entertainment, fresh eggs, Kava (for a relaxing morning), candles and terrific poultry, beef and pork grilled over guava wood. The lush eastern half of the Big Island is a garden, and even if you are a visitor without a kitchen, the markets of Hawai’i provide not only the best and exotic but a terrific insight into cultural fusion, entertainment and certainly an opportunity to eat authentic prepared island foods. Thanks to the help of Hanni, a WordPress Happiness Engineer, I’ve been able to add a link on the sidebar to Google Translate that will automatically translate my blogs into Spanish – as well as a computer program is able. 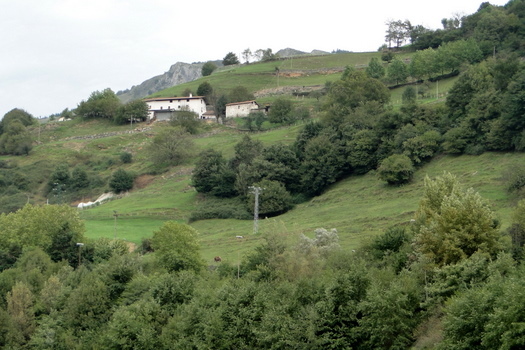 Still a modest sized town of 10,000 founded in 1268, Ordizia (on some maps Villafranca de Ordizia) lies in the heartland of Euskadi’s prized agricultural abundance. Iberico and Serrano hams – from pigs who diet on wild acorns – Idiazabal sheep’s milk cheese, and flawless lemon-yellow peaches are only a few of the products from farms following ancient as well as state-of-the-art green methods: organic, grass-fed and chemical-free. In Spain, these methods are not only tradition but in many cases codified in law. 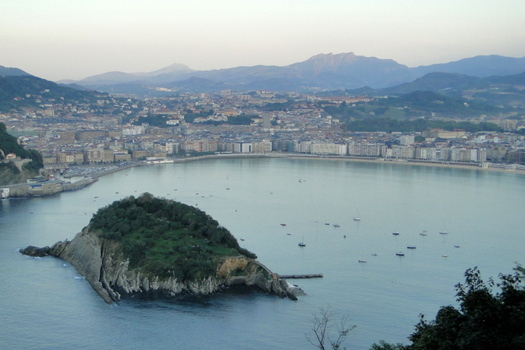 Leaving the beautiful Basque seaside town of San Sebastian on an early morning train for the 60-minute trip south to Ordizia, the countryside speaks its beauty. Vistas of lush green hillsides are dotted with cattle and centuries old white-washed red-roofed farm houses. Yet there’s resilience as over the years it was at the center of wars and atrocities. The past four decades has witnessed resurgence and affluence. 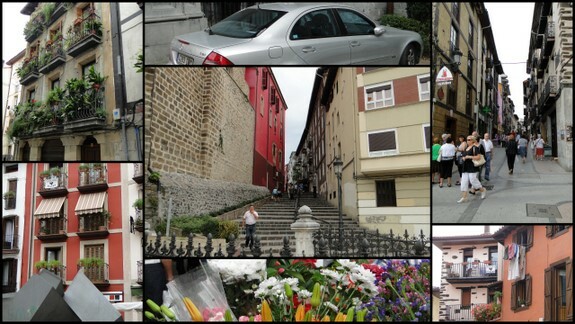 Like all towns in the Basque country, Ordizia is built on a hill close to water, in this case the Rio Oria. Easier to fortify, this topography also makes these century old villages picturesque and a decent aerobic workout. With perfect early October weather – high 70’s, sun, deep blue sky – I walked hilly, cobblestone streets lined by old narrow, townhouses whose window boxes were bursting with a profusion of flowers. 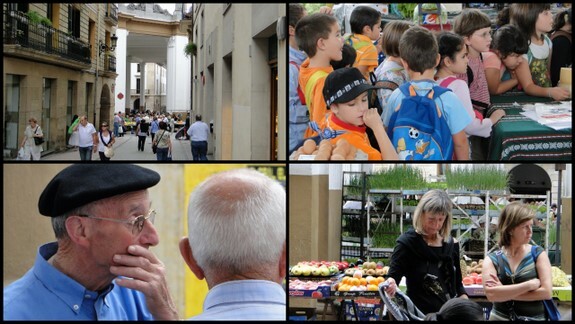 Ordizia’s Wednesday Farmers Market, in continuous operation since 1512, occupies the plaza in the heart of the old town, but, unlike most plazas, it’s covered by an open-air Romanesque-Renaissance structure befitting an important 500-year-old institution. 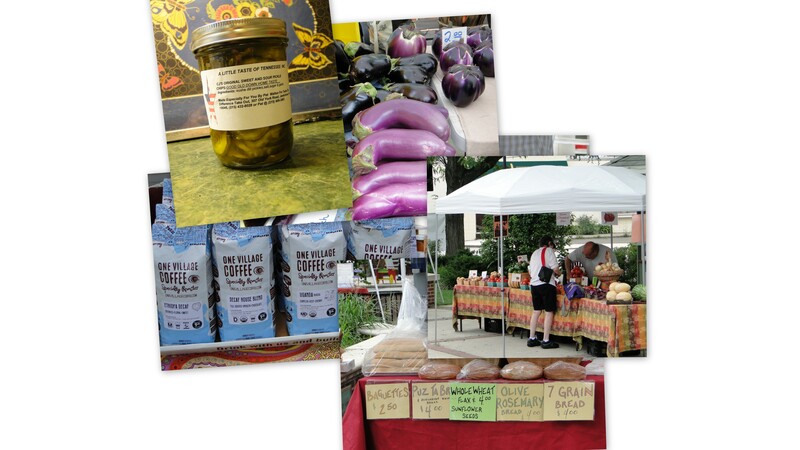 This is not just another farmers market. Along with the variety of customers who come to purchase goods for their homes and socialize, there are serious negotiations going on among commercial buyers, restaurants and farmers. These negotiations usually result in setting the prices for many products throughout Spain – until the next Wednesday market. Food here is serious business. 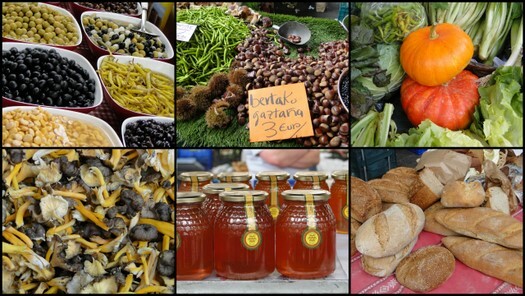 The food stalls glisten with vibrant colors: peppers, squashes, fruits – fresh and dried – pickles, olives and preserved foods. Bushels of freshly picked mushrooms, varieties I’ve never seen, vie for my attention with dozens of Euskadi’s famous sheep and goat’s milk cheeses. Baskets of breads studded with herbs, grains and seeds are close enough to local sausages and hams to make me desire a sandwich. 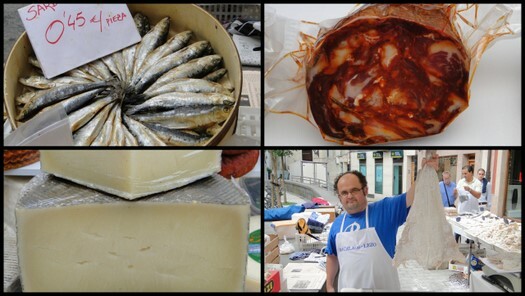 Fish, especially fresh sardines, anchovies and salt cod (bacalao), are well represented, as well as services – like knife grinding. 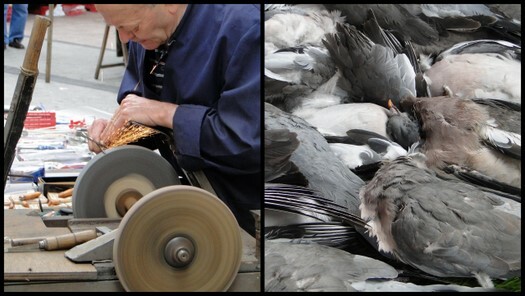 Serious cooks can purchase freshly executed pigeons, feathers and all, a Basque delicacy – of course most households know how to dress and prepare them. A milk dispensing machine is a standard farmers market service. Sterilized quart glass bottles are removed from a refrigerated compartment and placed under the dispenser. Empty bottles are returned to the attendant. 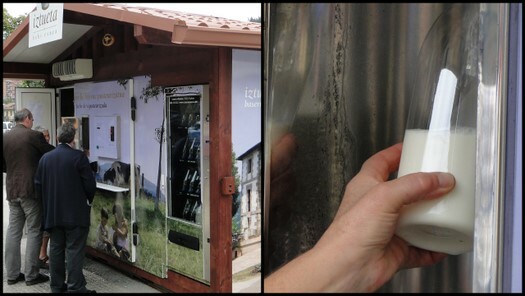 A local dairy co-op operates the kiosk. It was very popular. Cafes, butchers and cloth shops line the edge of the market plaza. 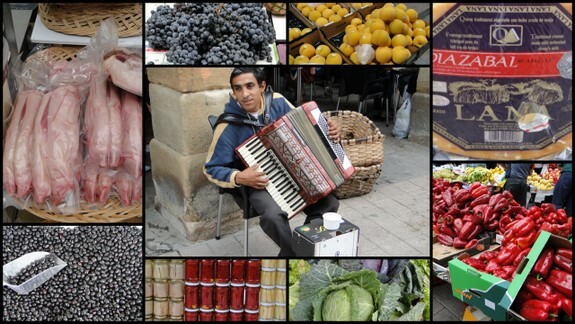 Sitting at an outdoor table listening to a musician playing Basque accordion compositions, sipping espresso, watching the bustle of a serious farmers market, I was struck by the permanence markets give to life. For the past turbulent 500 years the same hustle and bustle has occupied the Ordizia Farmers Market sustaining and celebrating every day life. For an interesting “birds-eye” view, follow this link for Ordizia. Move the map a bit east (to the left) and the white covered structure of the market will come into view. …and your heirloom tomatoes? In Jenkintown, of course. Now Jenkintown, (Montgomery County, PA) hasn’t been home to a farm in a century, and when I moved here in 1984, a rather small Acme pretty much was it for food supplies. The world for foodies has changed considerably starting in the mid-1990’s. Zagara (short-lived but exciting while it lasted), Whole Foods, Produce Junction, Trader Joes, Peas in a Pod, and the Acme, are all within walking distance or short drives from anywhere in Jenkintown. The farms of Philadelphia’s surrounding counties – Bucks, Montgomery, Chester, Lancaster and Berks – are historically famous for their products. 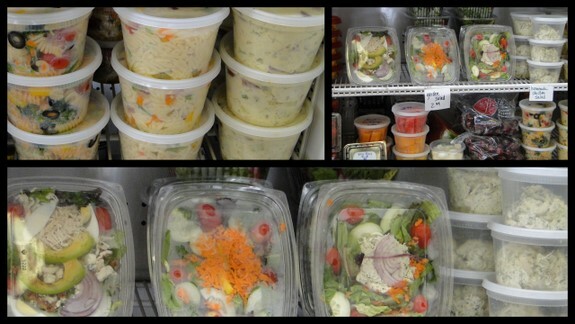 Yet in this age of diet-by-frozen-foods, we forget that there are places within less than an hour’s drive where leg of goat (grass-fed) is available, as well as drop cherries, raw honey and Thai eggplant. 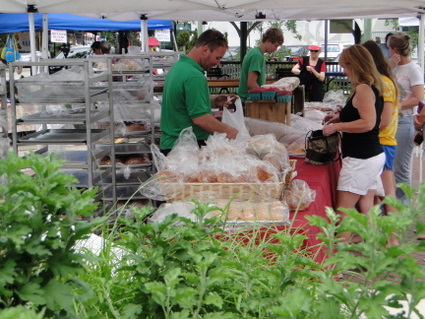 This June, Jenkintown inaugurated a weekly Wednesday Farmers Market in the Town Square from 1:00 PM to 6:00 PM. For a variety of reasons, today was the first time I had a chance to check it out. I walked the less than 10 minutes from my house not necessarily with high expectations that I’d discover anything different from the normal stands of fresh, small-farm produce I’ve come to expect. It’s nice to be surprised in your own backyard. 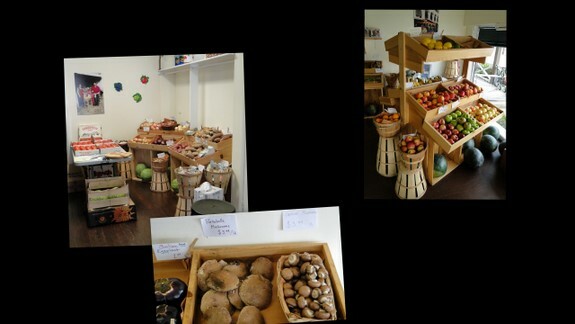 Three sizable stands of produce were brimming not only with the normal assortment. Herrcastle Farms (Holtwood, PA, Lancaster County) has an impressive display of heirloom tomatoes and the unusual drop cherry – beautiful yellow color and crisp texture. 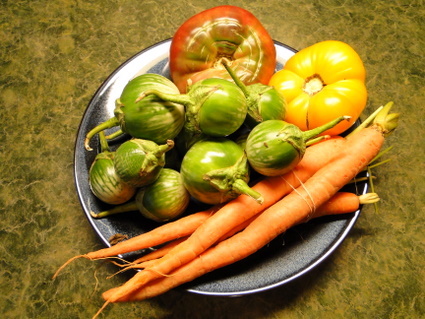 Tall Pine Farms’ (Rushland, PA, Bucks County) table caught my eye with a half-dozen eggplant varieties, including the crisp, tennis ball sized Thai eggplant that’s great in curry and stir-fry. Farmer Thad of Jett’s Produce (Telford, PA, Montgomery/Bucks County) prominently displays a sign “We grow chemical free.” Isn’t that organic? To Farmer Thad, it’s “organic” minus the bureaucracy, paperwork and high fees to be FDA organic certified. Herrcastle and Tall Pines, as well as many small farms I know in Pennsylvania, agree. Not all is produce. In the center of the square at least six long tables were overflowing with cinnamon rolls, muffins, carrot cake, decorated cookies and at least a dozen savory breads including a still warm loaf of Olive Rosemary bread. This carb heaven is the work of Tabora Farm and Orchard (Hilltown, PA, Bucks County). It seems Tabora’s still a farm and orchard with a bakery that produces 160 different baked items per day! A small stand displayed raw honey, including my favorite, Buckwheat Honey. The product of Everich Honey Farm (Cedars, PA, Montgomery County), I had an informative conversation on the still real threat of Colony Collapse Disorder and the possible ties to the over use of chemicals in American farming. Coffee is in the mix as well with One Village Coffee (Souderton, PA, Bucks County) a company that takes corporate “fairshare” seriously, funding farming projects in third world coffee growing areas. 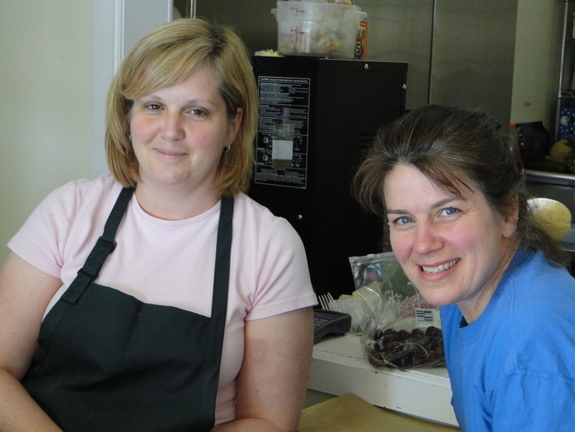 A Little Taste of Tennessee (Jenkintown, PA, Montgomery County) started in April by Pat Walton, a Tennessee native is a new catering business and weekend restaurant in Jenkintown featuring the country foods of that state. At the market, they were offering Ms Ethel’s and Aunt Weeze’s nut brittle and a variety of fresh, crisp pickles – the Bread and Butter nicely under sweetened. Varieties with jalapeño peppers would probably burn my tongue off. Two craft stands are in the mix – one selling hand bags made with recycled material, and another table of handmade “Jewelry From a Writer, for Word Lovers” from Words at Play (Elkins Park, PA, Montgomery County). Janet Falon, a writer, creates necklaces and bracelets built with word blocks so the wearer can create a message. What really caught my eye, shortly after I arrived at the Market, was a mobile kitchen parked at the edge of the Square. Thinking it was a misplaced Philly Steak and hotdog stand, I finally walked up to the M & B Farview Farm (Hamburg, PA, Berks County) mobile unit to discover a refrigerated/freezer trailer selling grass-fed beef, veal, lamb, goat and pork. With a 142 acre farm (soon to grow to over 200 acres) M & B, from looking at their order form, utilizes every part of an animal offering kidneys, hotdogs, sausages as well as a full line of cheeses from both cow and goat milk. M & B’s ranching techniques would make both an American Indian and an Argentine Gaucho proud! 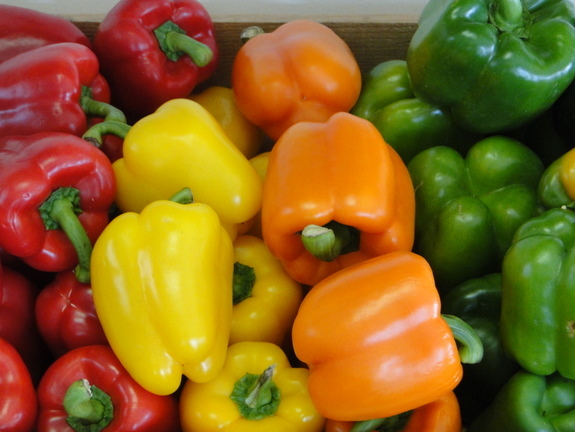 Prices at the market are comparable to Whole Foods or anyplace selling premium products, but now you know where they’re coming from – your own backyard. For a tourist, the Pampas present an endless flat grassland punctuated by small, nondescript towns and immense fenced estancias, many still owned by families that are a “who’s who” of Argentine society. Traveling through the Pampas is akin to driving through Nebraska. As often as possible during my many trips across the Pampas, I traveled on comfortable overnight buses knowing that I was not missing any “sites” during the 1,000 mile journeys. Yet at day break, even bleary-eyed and looking out a bus window, I cannot deny the beauty of these grasslands bathed in the pink light of dawn, gossamer layers of mist hovering over the ground and the black cattle – herds of them – dotting the fields. Gauchos are nomadic horsemen riding the plains, following herds of cattle – “cowboys” who developed their own code of honor, music, machismo and myths. Fiercely independent, they wore black hats and wide belts, and always carried a well-sharpened knife – and they still do. As befitting an immigrant nation, the Pampas attracted its own unique settlers. Like the United States, Argentina actively recruited immigrants to fill the vast and empty country. Eight hundred eighty-four Jews arrived in 1889, escaping persecution in Russia, without tools or provisions in a geography far different than Eastern Europe. Months later, William Lowenthal, a Romanian Jew, surveying the countryside for the Argentine railroads, discovered a ragged band of settlers living, literally, at the end of the line. Having been transported to the sparsely populated northern Pampas, they were stranded and their meager savings were soon exhausted. Lowenthal found them subsisting on hand-outs from workers extending the line. Appalled, he urgently appealed to the Baron Mauricio de Hirsch, banker to the Hapsburg dynasty, philanthropist and builder of the Orient Express, the legendary rail link between Paris and Istanbul. De Hirsch immediately came to the aid of the impoverished settlers. This was the beginning of the first Jewish agricultural colony in Argentina: Moises Ville (the Village of Moses). With an endowment of $450 million ($13 billion in 2017 dollars) the Baron de Hirsch created the nonprofit Jewish Colonization Association. Between 1891 and 1932 the JCA purchased one and a quarter million acres in the provinces of Santa Fe, Buenos Aires as well as watery Entre Rios for Jewish settlement. The Jewish Colonization Association gave each family a 200 acre homestead, a mortgage, a few cows and some chickens. Yiddish-speaking Jews from Eastern Europe, many with beards and side curls, were transplanted to Spanish-speaking, Catholic Argentina bringing the Torah, pickled herring, building wooden synagogues and becoming farmers and ranchers of the vast pampas. Jewish gauchos, playing guitars and sipping mate, could be seen strolling the village plazas in the Argentine colonies. Where there had been a wilderness, the pioneers built schools and libraries, hospitals and theaters, synagogues and agricultural cooperatives. The 72-minute documentary, Legacy — produced by the International Raoul Wallenberg Foundation — is the second best experience other than traveling through the pampas. Despite an element of antisemitism, which seems to be fading since the terrible events of the early 1990’s, Jewish-Argentine society has prospered, but most of the Jewish towns in the Pampas either no longer exist or have lost their Jewish populations. In the post World War II years, the younger generations migrated to Buenos Aires for educational and professional opportunities. Today the Jewish community in the capital is over 200,000, and you can eat kosher pizzas or grilled Argentine beef at El Pasaje Resto & Bar and at dozens of kosher delis and shops in Buenos Aires. Food does bring people together. …and to your own backyard. Travel with Pen and Palate Blog will soon post on organic food in Pennsylvania, an ode to the ham and cheese sandwich and an essay on Jewish gauchos in Argentina. Many childhood weeks visiting grandparents in Florida and wandering the South of the 1950’s excited a life-long desire to travel. Summers spent in our ancestral village in Canada stirred a love of discovery. A year of university in Ireland, nine years working in Puerto Rico, travels throughout Europe, the Caribbean Islands, Central and South America, southern Africa and South East Asia has infected me with the incurable desire to have fun learning about other cultures. Six months exploring over 15,000 miles of Argentina while creating the web site www.travel-with-pen-and-palate-argentina.com cemented the fun of sharing experiences through vivid personal essays. Thirty-five years of experience in the restaurant and hospitality world, and as a Chef/Educator, coupled with a diverse educational background, helps me focus on the kaleidoscope of images a traveler experiences every day. What makes the local area unique – what culture/diverse backgrounds did the residents come from? What traditions did they bring to a new land?” The more I travel the longer the list of questions, which makes the journey more exciting. Travel with Pen and Palate will apply the same sense of wonder whether writing on a great craft market in New Jersey or catering a Good Friday meatless buffet in Tierra del Fuego. Travel with Pen and Palate is a magazine without borders.